HTWR is known for its traditional 'Songket' outfits and its meticulous arrangement of the traditional Sanggul Lintang' making HTWR exceptionally unique in the artistry scene in Singapore. HTWR has also introduced current and contemporary designs in its bridal attire. To date, HTWR has evolved to be modern and sophisticated yet maintaining its traditional emphasis. 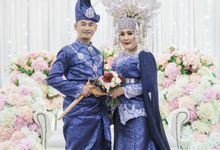 Hambali The Wedding Regalia (HTWR) was established in 2010 to provide holistic bridal services with a traditional incline. Named after the founder himself, Mohd Hambali is amongst Singapore's celebrity make-up artists. HTWR is known for its traditional 'Songket' outfits and its meticulous arrangement of the traditional Sanggul Lintang' making HTWR exceptionally unique in the artistry scene in Singapore. HTWR has evolved to be modern and sophisticated yet maintaining its traditional emphasis.